Jane da Mosto appears on X-Style and We are here Venice is featured for its role “nurturing an active dialogue between the city and its ecosystem, to keep the Venetian lagoon alive”. Motherboard have made a documentary called ‘Venezia 2100’ on the prospects of the historic city of Venice in the face of climate change. Talking to researchers, shopkeepers and Venetian citizens, it seeks to understand how Venice is preparing itself to confront the problems that climate change and rising water levels pose. The reporters did a huge job bringing together masses of information from a wide variety of sources. The take-home message is if the MOSE mobile barrier system functions properly, its essentially because the experts say they HOPE it will (& in spite of huge corruption and management malpractice)! Inevitably, hours we spent spent talking with the PBS team were condensed into a statement about MOSE, whereas I had tried to describe and explain all the work we’re doing to improve understanding and awareness of water levels – together with necessary changes we are campaigning for in the way Venice is governed – which should open up a longer future for the city and lagoon system. Coverage on local TV news of the Ca’Foscari/Fondazione Venezia Climate Change Summit to mark the exhibition “Arctic. Last Frontier”. BBC World live interview following the November 2016 #Venexodus protest about the lack of affordable housing in Venice. FAI/Associazione Piazza San Marco/wahv L’ACQUA E LA PIAZZA EXHIBITION at the Olivetti Showroom and in the Piazza San Marco area (4 Nov 2016 to 8 Jan 2017): brief guide by Anna Zemella (photographer) and Jane da Mosto (curator) filmed by Loredana Spadon. BLOOMBERG PHILANTHROPIES AT THE 2013 VENICE ART BIENNALE: Group discussion with Gregor Muir in association with the Sarah Sze installation at the USA Pavilion Internal Universe: Beyond the Garden of Earthly Delights. The aims of wahv are described in the context of “relational aesthetics” – Venice without Venetians would be like the Biennale without Venice! ANTENNA 3 NEWS – ARSENALE APERTO ALLA CITTÀ (24-26 April 2014) a special invitation from Forum Futuro Arsenale (in cooperation with the Municipality) for Venetians to feel like the Arsenale is theirs again and to renew their appeal to local government to allow space for community projects in the compendium. VENICE INTERNATIONAL LECTURE SERIES 02/10 (19 NOV 2011): platform for local and international professors to discuss key and current issues. ASSOCIATED PRESS TV (2 June 2009) interviews on the usual challenges for Venice. FIELD STUDIES OF THE VENETIAN LAGOON EXHIBITION at Torre Massimiliana, Sant’Erasmo (July – November 2016) of salt marsh photographs by Liz Nicoll curated and produced by wahv, briefly explained by Jane da Mosto and filmed by Loredana Spadon. FINISSIAGE AT THE 13TH ARCHITECTURE BIENNALE – COMMON GROUND (24 Nov 2012): workshop arranged by wahv in collaboration with Theatrum Mundi on making collective values more visible. INFOGRAPHICS TO EXPLAIN THE DEMOGRAPHIC SITUATION (2008) by Nicolò Loprieno, IUAV Faculty of Design & Arts – Visual & multimedia communications. VOGLIAMO VENEZIA flashmob in front of the Doge’s Palace at 7am on Saturday 5 September 2015. 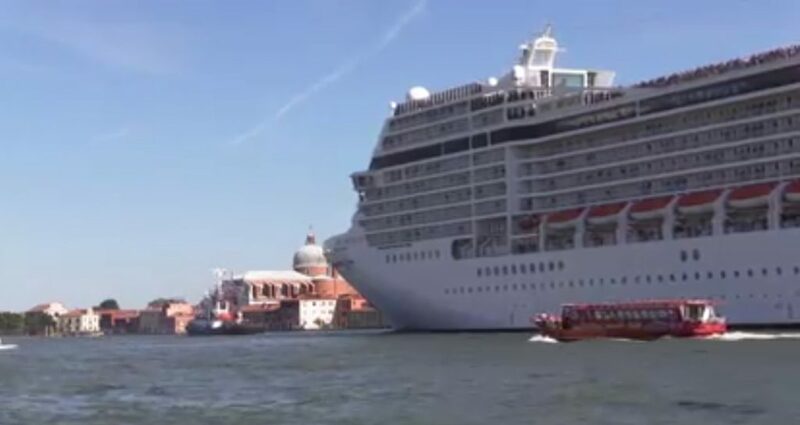 This event was linked to a media campaign and open call for images showing the impact that the large cruiseships are having on Venice and the Lagoon, in preparation for the visit by the UNESCO/ICOMOS/RAMSAR delegation to Venice. The aim was to solicit UNESCO to continue to bring attention to the serious problem of large ships navigating in the Lagoon and to highlight the central role of the city’s inhabitants in shaping the future for Venice and the Lagoon.